Individual charitable donations fell by £500m last year to £9.6bn, the lowest amount for seven years, according to research from the Charities Aid Foundation. 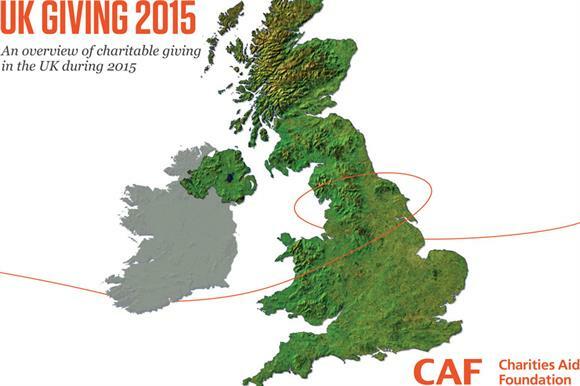 CAF’s annual UK Giving report, published today, shows that UK adults donated 5 per cent less last year than in 2014, when individual giving levels reached £10.1m. The 2015 figure was equal to that recorded in 2009, according to a spokesman for CAF, although he said the year-on-year fall was "within the margin of error" and should not be regarded as overly significant. The report says the apparent decrease could be an early indication of a fall in charitable giving among individuals, although more data is required. CAF reported last year that giving reached £10.6bn in 2014, which would have made the decline even greater, but UK Giving 2015 says this figure was later downgraded to £10.1bn due to a change in methodology. The study also shows that for the first time, the most popular cause to donate to was children and young people, with 30 per cent of those who gave money in the past four weeks saying they gave to charities in this cause area. The second most popular cause was medical research, with 29 per cent donating; the third was animals, with 22 per cent. In terms of frequency, most people said they gave to charity from time to time (41 per cent) or monthly (31 per cent). The median monthly amount given by a donor in 2015 was £14, the same as in 2014, while the mean donation was £37. Just under one in three people sponsored someone for charity in 2015. Among those being sponsored, those fundraising for hospitals and hospices received the highest average amount (£34), followed by religious causes (£31) and physical/mental health care (£29). Religious causes again received by far the highest average donation, at £49. Second was overseas aid/disaster relief (£22) with elderly causes in third (£20). Another finding was that 16 to 24-year-olds were more likely to give to educational institutions, 25 to 44-year-olds preferred children and young people’s causes, 45 to 64-year-olds preferred animal charities, conservation, the environment and heritage and overseas aid, and people aged 65 and over favoured religious causes and hospitals and hospices. Londoners were found to be the most likely to have given to arts and overseas aid charities, while those in the East Midlands selected medical research charities, and people in Wales indicated a preference for sports and recreation charities. The methods by which people donated to charity were almost unchanged compared with 2014, with cash being by far the most common way of giving, used by 55 per cent of respondents. The research shows that men continued to lag behind women in volunteering, donating and sponsoring, with 52 per cent getting involved in some form of charitable behaviour in a typical month in 2015, compared with 60 per cent of women. John Low, chief executive of CAF, said in a statement: "Charities need to work harder to motivate men to back good causes and, importantly in the long term, find new and better ways to get people involved in charitable giving at every age. "Sporting fundraisers and appeals such as Movember have gone some way towards getting more men and young people giving, but it is clear that more still needs to be done."